"Work and Income is owed $180 million from former and current clients who have defrauded the system - and that amount has doubled in five years." Yesterday a journalist working on CheckPoint sent me some OIA data looking for comment. I told him I've have never seen figures this big. That's because they represent cumulative debt. 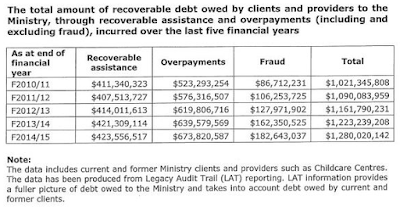 In the note it says: "The data has been produced from the Legacy Audit Trail (LAT) reporting. 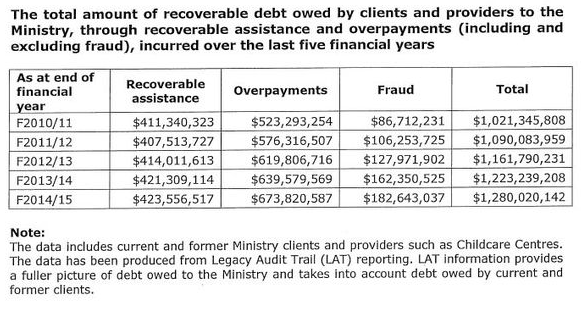 LAT information provides a fuller picture of debt owed to the Ministry and takes into account debt owed by current and former clients." MSD is getting better at detecting fraud. 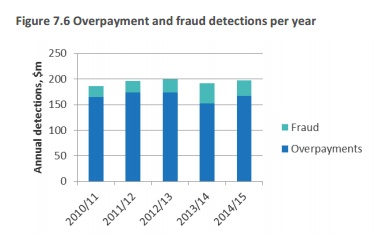 Fraud detections doubled in 2013/14 because of MSD's IRD data-matching programme, It isn't getting better at recovering the debt. But I would be surprised if the behaviour of beneficiaries has changed particularly. The second most common type of benefit fraud (after working while claiming a benefit) is people claiming a single parent benefit when they are in a relationship. In February 2014 MSD started a 12 month trial involving following up with 1,616 sole parent support clients to establish entitlement to a benefit. Then, the Social Security (Fraud Measures and Debt Recovery) Amendment Bill passed into law in April 2014. It's purpose was "to make spouses and partners, as well as beneficiaries, accountable for fraud, and to enable the Ministry of Social Development to recover debt more effectively". Obviously not working yet. Maybe he wanted me to say something derogatory about fraudulent beneficiaries to provide 'balance'. Because he didn't use any of my comment. Just what this country needs. A bleeding-heart pop star with more money than sense. I recently wrote about the Upper Hutt man who had failed to sell his idea of the private sector funding school lunches to local businesses. Seems he has since started up a give-a-little-page to fund his Fuel the Need sheme. And Lorde has donated $20,000 with a message that she is "passionate about all kids having access to food at school". I'm passionate about parents taking responsibility for their children. Every time something like this happens we chip away at the societal expectation of 'responsibility' being the flip side of 'right'. It is each person's right to have children but it is increasingly everybody else's responsibility to look after them. And this super role model has just given that attitude the stamp of approval. If she wants to give away her money it'd be better spent funding a local community group that goes into the homes of these 'hungry' kids and finds out what's going wrong; what needs to change and shows the family how. And stays involved until the situation is resolved. I applaud her generosity but she needs to think very hard about what comes next. 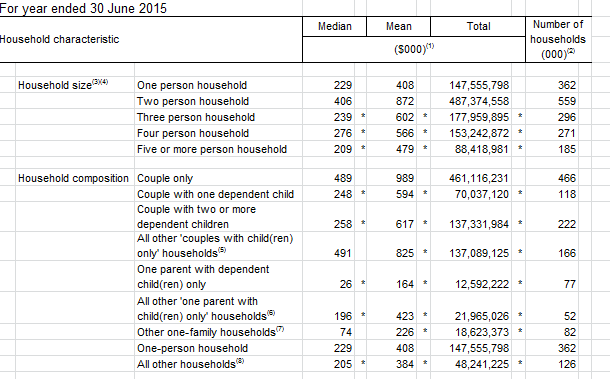 The median household wealth at June 2015 was $289,000. 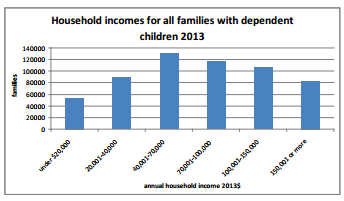 One parent households with dependent child(ren) have a median household wealth of just $26,000 - less than a tenth of the median. The wealthiest households are empty-nest couples or those with adult children living at home. In the tiny cohort of my children's friends, more than half of their parents split at some point after their birth. It's a fairly middle-class sample. 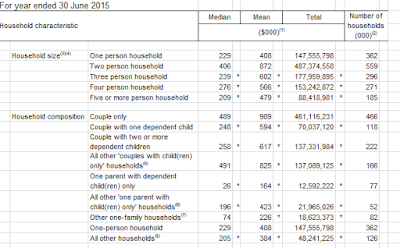 About half of the separated mothers have stayed single. We live in world characterised by relationship instability yet expect or want the division of wealth to remain what it was when marriage was almost universal and divorce unusual. 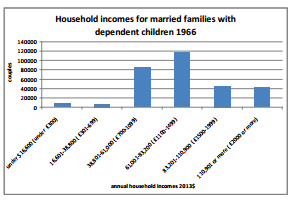 In 1966 far more families were clustered in the two middle income bands. There were fewer families at the extremes. Yet the constant refrain is that growing inequality is the fault of factors beyond the individual's control. I believe it's more a facet of personal choice. Don't get me wrong. I am all for personal choice. But there remains a distinction between good and bad choices, notwithstanding a 'bad' choice may be 'good' choice if you don't mind being poor. But don't then complain about it - personally or on somebody else's behalf - and blame a host of other factors like capitalism, unemployment, low wages etc. The current levels of income inequality and wealth will continue to grow if people continue to choose to raise children alone or have children by multiple partners. Not all, but most, will end up at the wrong end of the income scale. Lawyer blames Moko's death on "extreme poverty"
Ron Mansfield, the defence lawyer for one of Moko's killers, Tania Shailer, blames "extreme poverty" for her actions. Not twice but three times he said that 'we' need to deal with poverty or more of this will happen. What an insult to the many thousands of parents who would be financially in the same boat as the killers were, but who still manage to make their children's safety and well-being paramount. Resorting to the poverty excuse is just facile. "As a country we need to stand back and we need to look at how we're dealing with poverty. There's extreme poverty out there and where there's poverty there's stress. And all of the reports on child abuse show us that where there's stress there's going to be higher rates of child abuse." I am the founder the Sensible Sentencing Trust (SST), an organization set up in 2001 to provide support to victims of crime, and to lobby for changes to the law. Our organization now has some thousands of members and many more supporters. Along with many, I am both appalled and bewildered by the decision to replace the charges of murder originally laid against Tania Shailer and David Haerewa for the killing of Moko Rangitoheriri (Moko) with charges of manslaughter, to which the accused then pleaded guilty. Clearly this came about by what is popularly known as a “plea bargain”. It is unclear whether the prosecution or defence initiated the discussions which led to that deal. No one is talking. SST has a number of qualified lawyers as legal advisors. All of those lawyers find the decision inexplicable, assuming the facts are as they have been widely reported. One criminal defence barrister with 25 years experience has said that if the facts are as reported, he would not even have bothered trying to get the charges against Moko’s killers downgraded. At no time since this story broke has there been any statement from your office which clarifies or contradicts the facts as reported in the media. The Crown Solicitor in Rotorua has referred all queries to you. We understand that you – or one of your delegates – approved the plea bargain under which the murder charges were replaced with charges of manslaughter as required by law. As I have said, we have sought advice from qualified and experienced lawyers both within and outside our ranks. No-one can explain – or even speculate on – the reasons for this deal being done. Most of our advisers say “there must be something more”. On behalf of the members of SST, I would like to know if there is in fact anything more, and why exactly this decision was made and if indeed you or your office made it. SST is organizing a number of rallies to be held at various Courts on the day of the sentencing for Tania Shailer and David Haerewa. While there will be a number of marches and rallies around New Zealand as a build up to the Court House rallies on the 27th. The purpose of the rallies on 27th June will be primarily to address the plea bargain issue. We would like to read out a statement from you to hopefully allay the publics’ worst fears and I invite you to submit such a statement for me to action.